Thank you for visiting the Programming With Basics- A Solution Blog “Write for Us” page!. 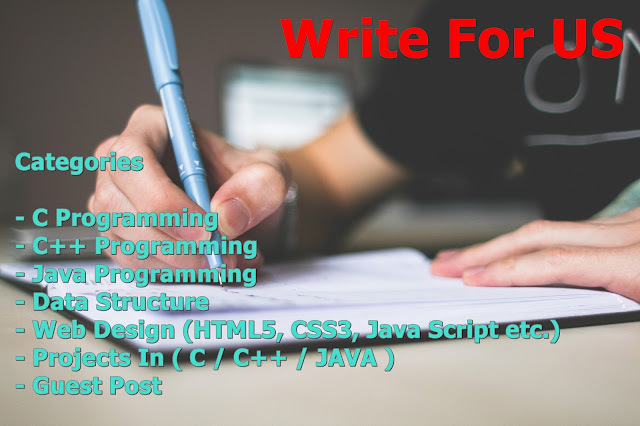 While we greatly appreciate your interest in writing for programming and web designing, contribute your knowledge with us If you have any idea about programming and coding write for us. Thank you for your interest if you want to share your ideas about programming then this is a golden chance for you can join our family lets make coding easy. Content Quality:- Content should be a minimum of 800+ words or 3000+ characters and should cover the topic in detail like screenshots and videos and alignment of screenshots should be in center and image size should be less than 100kb. Credit:- We respect hard work so no need to worry about credit you will be awarded credit + backlinks. Self-Promotions:- In your post, you will be responsible for self-promotion your post share your post on the social platform. if someone comments on your post you are responsible for the answer. Copyrights:- Your post should be original cause we respect everyone’s work. In case we find out that you have copied a post from somewhere else, you will get a ban and you post and profile will be deleted. Post:- You are agree to use your Guest article for commercial or promotional purpose, We have Rights to Manage, Edit, Add, or Remove article In case if someone just report or find copied content. We can also Edit, Add or Remove anything in Article to make it SEO friendly and Increase Readability. Note:- After sending an article to me I assume that you accept all terms and policy and any changes done by me in your article is you are accepting for example post a link of related articles etc. ★★Update-2019★★:- If you want to share your post with benefits then please read continue, 1-month free advertisement (I can assure No adblocker can stop you for a month advertising ) + 2 high-quality backlinks (PR-9 or PR-8, Do-Follow) + 50 times share on social media + no need to follow blog rules (No-Limit in an Article). You can check our client--> App4Rent are taking benefits(Pay-50$ for this service and getting benefits). Misc. (Related to programming and web designing). Enter given details and enter to my world.attachment send to Email:- programmingwithbasics[at]gmail[dot]com.